The crackdown on monks in Myanmar is something I've not commented on. My bad. The government said its security forces opened fire today on demonstrators who failed to disperse, killing one person, and witnesses said police beat and dragged away dozens of Buddhist monks in the most violent crackdown in a month of protests in Myanmar. 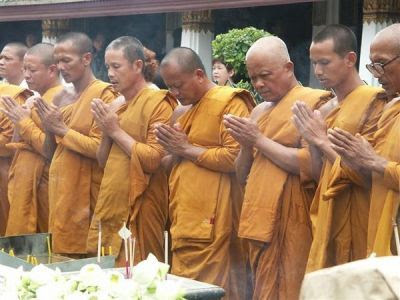 While dissident groups reported as many as five dead, including monks, the military junta's announcement on state radio and television was the first acknowledgment that force has been used to suppress the protests and the first admission that blood had been shed. The United States and the European Union condemned the attacks and called on the military rulers to open a dialogue with pro-democracy leaders, according to a joint statement on the sidelines of the U.N. General Assembly. I've never been to Myanmar, but have had experiences and conversations with Buddhist monks in Thailand and Malaysia. Folks, these people are so serene, warmhearted, spiritual, you (or at least I) feel very calm in their presence. A funny side note; we had a nice talk with a monk who advised us on marriage. Quite an ironic discussion to say the least. Its impossible to picture soldiers gassing, beating, arresting such gentle people let alone killing even one. But I'm unsophisticated in such things, I guess. Also have to do this. Of course this is de rigueur with the Bush administration. Stomp on the dissidents. Don't allow anyone to challenge authority. Put them in a "free speech zone" and keep the fuckers away from the podium where they might be heard.